If the Mission E is as huge a success we we expect, then the Porsche 918 Spyder replacement could look something like this. In the mind of this humble typist, there is one major issue with the current generation of hybrid hypercar trinity. That would be the fact that somewhere in the tall order to reform the hypercar using the latest complex technology was an argument between designers and engineers, and it’s obvious that the designers lost. In classic McLaren fashion, the P1’s design seems to be inspired by whatever shape a computer thought would best cut through the wind. As for the LaFerrari, well no one really knows what happened there. Perhaps Maranello got a bit too lost in its pursuit to mimic the F1 car, but the Porsche 918 Spyder is no exception. As impressive as it looks in person, the front end seems to try its best to remind the public that this is still a Porsche as if they would soon forget it. Thankfully, Russian rendering artist Aksyonov Nikita feels that things don’t have to be this way. 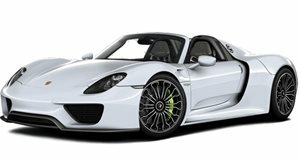 Taking inspiration from one of the most attractive modern Porsche designs, Nikita gave the 918 Spyder a facelift using styling elements from the Mission E concept, a car that Porsche proclaims will make it to production fairly unchanged from its current state. Even though the hypercar was only slated to have a production run of 918 units, all of which have found garages, it’s fun to imagine what a facelift would look like. Who knows, maybe the result we see is not too far off from the face that the actual 918 successor will bear. The most apparent changes to what Nikita dubs the 918 S are made to the fenders, which gain the enhanced shoulders of the Mission E as well as the same LED lights up front. At the rear is a diffuser as well with a body-length light strip, making this alternative more believable given that this is a move Porsche would be likely to pull off. For better or for worse, the squat rear end of the Mission E fails to make it over to the rendering. Given the Mission E’s sports car stance, not much had to be changed to the sides of the car, but a dark shade of contrasting paint licks at the lower end of the car as it does on the Mission E concept and helps round off the gorgeous design. Unfortunately, as we know too well, there will be absolutely no facelift for the 918 Spyder because Porsche would rather wait out the full ten year interval and replace its hypercar with an all-new flagship. This should be out sometime in 2025, so don’t wait up for this rendering to come to life.